Deontay Wilder understands why fans are frustrated. The unbeaten WBC heavyweight champion doesn’t want a rematch with Bermane Stiverne, either. That’s why Wilder went out of his way to make an optional defense against unbeaten Cuban Luis Ortiz, including arranging six-figure compensation for Stiverne to step aside. Once Ortiz tested positive for banned substances, though, Wilder was left with little choice but to make a mandatory defense against Stiverne on November 4 at Brooklyn’s Barclays Center (Showtime). The 6-feet-7, 225-pound Wilder (38-0, 37 KOs) thoroughly out-boxed Stiverne (25-2-1, 21 KOs) to win the WBC championship in January 2015. Wilder won that 12-round bout by large margins on all three scorecards at MGM Grand Garden Arena in Las Vegas (120-107, 119-108, 118-109). 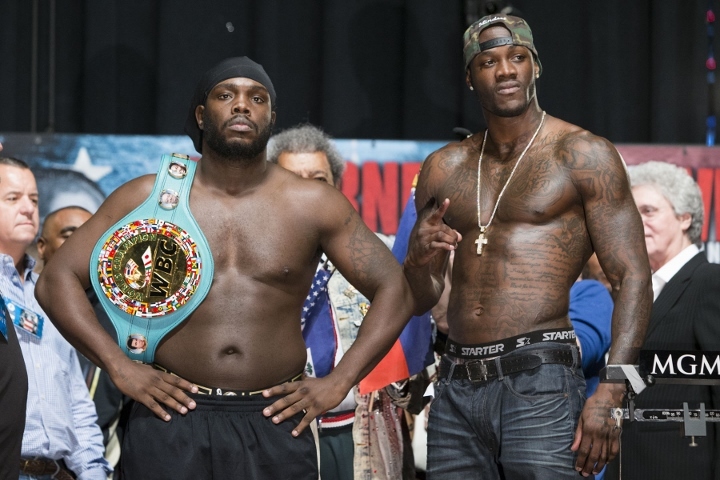 The Haitian-born, Las Vegas-based Stiverne has fought just once in nearly three years since he lost to Wilder. Derric Rossy dropped Stiverne in the first round of that November 2015 bout, but Stiverne survived and came back to defeat Rossy (31-13, 15 KOs) by unanimous decision in Las Vegas (96-93, 96-93, 95-94). Stiverne, who’ll turn 39 on November 1, claims dehydration hindered him during their one-sided bout. Tuscaloosa’s Wilder still expects to beat the only opponent he hasn’t knocked out even easier in their rematch. Wilder, who’ll turn 32 on October 22, has won by knockout or technical knockout in each of his five title defenses. He had hoped that beating Ortiz (27-0, 23 KOs, 2 NC) would’ve silenced skeptics who’ve criticized his level of opposition. The outspoken knockout artist scoffed at Stiverne’s contention that he hasn’t improved since their first fight.